The appraiser Valuation 2009 conference in New Orleans in November offered unprecedented access to key regulators, AMCs and other decision makers regarding the future of the appraisal industry- that’s the good news. The bad news is that you may not like what they are saying. Honchos from FHA, Fannie Mae, Freddie Mac and FHFA, the agency overseeing Fannie and Freddie, laid out their positions on the state of the industry since the collapse, the Home Valuation Code of Conduct (HVCC) and recent and proposed legislative and policy changes at their agencies. According to these folks, the result of HVCC so far are less pressure and better appraisals. FHA clarified what it means by its dictate that appraiser fees must be customary and reasonable- and unless you own an AMC, you’re not going to like that either. Alfred Pollard, General Counsel at the Federal Housing Finance Agency (FHFA), in the keynote, stressed the importance of appraisers and their role in “getting the value right.” In answering appraiser objections to HVCC, he said that the core of the Code supports appraiser independence and that this is something everyone should support. His remarks at the conference make it clear that FHFA considers the Code a success. When addressing the unintended consequences of HVCC, including the dominance of appraisal management companies (AMCs), the downward pressure on fees and the catastrophic effect on the businesses of many appraisers, Pollard said, “HVCC doesn’t effect the marketplace,” meaning that there are no provisions in HVCC mandating the use of AMCs or which address appraiser fees. While accurate, the response seems to dismiss any cause and effect relationship. Pollard said that no decision is made yet whether HVCC will be allowed to expire in November 2010 but that whether it is renewed or not, the “core values (of the Code) will remain.” He seemed to echo what many others say: that even if HVCC is allowed to sunset a year from now or is reversed by one of several legislative initiatives in process, the current system is so firmly entrenched- including changes to the seller guides- that there is little chance of things going back to the way they were. Regarding the financial woes many appraisers complain about, Pollard again failed to publicly acknowledge any cause and effect, saying that the real estate bubble burst and that has nothing to do with HVCC. Working RE, via the HVCC Talkback Survey and Blog, has received many hundreds of comments from appraisers that directly link implementation of the Code in May to a catastrophic loss of business as a result of being barred from working with their long-time mortgage broker clients. Over 4,000 appraisers have responded to the survey to date. At one point, Pollard referenced the comment period for HVCC prior to implementation, seeming to suggest that appraisers had their chance to make their concerns known- so what’s all the fuss about now? The software maker a la mode confirms that it forwarded over 31,000 letters in opposition to HVCC from appraisers and loan originators to New York Attorney General Andrew Cuomo during the comment period. This is just one batch of comments. To date, one petition to reverse HVCC has over 117,796 signatures (find the link to the petition to sign and view signatures at WorkingRE.com, Sidebar Info: HVCC Petitions). The Working RE/OREP HVCC Talkback Survey reports that 92 percent of appraisers are “not in favor of HVCC as written.” When have 92 percent of appraisers ever agreed on anything? In general, the report from the conference suggests that the regulators who matter the most are fully behind HVCC and seem either to be unaware of or unwilling to give credence to what appraisers are saying: that many thousands are losing or have lost their businesses because of HVCC and, more importantly, that quality is taking a hit as long-time, seasoned professionals refuse to work for wages that they consider unsustainable. A result, these appraisers say, of AMCs that seek the lowest bidder instead of the best appraiser. When asked about lower quality appraisals since HVCC, Pollard said that the issue will be addressed if it is considered to be a problem by Fannie Mae and Freddie Mac. So far, he said, evidence suggests the opposite- that appraisal quality is actually better. Jacquie Doty, Director of Collateral Policy, Credit Policy and Portfolio Management at Freddie Mac, said the Code has stemmed the flow of complaints and is having “its desired effect” in reducing pressure. Doty said that appraisal quality also has improved. She said Freddie Mac has seen a statistical improvement in the quality of value conclusions by appraisers as measured by their internal proprietary automated valuation model (AVM). “Appraisal bias” is down since HVCC took effect, she told the audience. Doty told WRE that she is not certain, however, that the improvement in quality can be attributed solely to HVCC. Other possible factors, she said, could be the 1004MC form, which requires better reporting and closer scrutiny by lenders. If you thought that FHA might be your white knight, given its recent announcement requiring greater transparency, a clear separation of appraiser and AMCs fees and its mandate that appraiser fees be customary and reasonable, you may want to think again. Milton H. Corson, Jr., MAI, SRA spoke on behalf of HUD/FHA. Corson told WRE that FHA is not in the business of setting fees. “If someone feels $200 is sufficient, that’s their business decision,” Corson said. He said “customary and reasonable” is common sense and appraisers should know what a “commensurate fee” is for their services. “There is no line in the sand and there will be no regulating by FHA,” Corson said. A fair translation is that customary and reasonable now means the lowest bidder. Meanwhile, Gerald Kifer, Supervisory Appraiser at the Department of Veterans Affairs, told the audience that the Veterans Administration (V.A.) does set fees, still uses mortgage brokers and has had, “zero fraud” reported. “The panel rotation system has served us very well,” Kifer said. He also noted that the V.A. has a “negative subsidy,” meaning it makes money and uses no tax dollars. One or two appraisers in the audience challenged the panelists on certain issues but opposition was mostly muted and confined to private conversations. Privately, while some appraisers are making a go of it working with AMCs, most are unhappy with the low fees and the extraneous work imposed by the extra layer of administration. Many told WRE that they’ve seen highly qualified friends and colleagues leave the business rather than work for less, lamenting that this is not good for the profession. The ones faring the best since HVCC seem to be those who had established relationships with AMCs and who have found the best to work with. The appraisers still struggling express continuing bitterness at having their lifetime of expertise minimized and their services commoditized down to the lowest bidder. 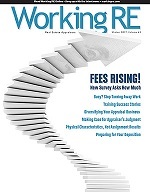 As we will report in the new print edition of Working RE, mailing in early January (already to press), current results from the HVCC Talkback Survey and Blog reveal that “AMC shopping” may be a survival strategy appraisers are adopting. Seventy-two percent (72%) of survey takers report that they are satisfied working with appraiser management companies (AMCs) at least some of the time. (Twenty-eight percent (28%) respond “never” satisfied). This may mean that those who are surviving are picking and choosing the AMCs to work with and firing the others, just like they did with mortgage brokers. While most appraisers report a slackening of “pressure to make a deal work” since HVCC, the issue is far from resolved. According to survey results, which will be reported in the upcoming WRE, over half of the appraisers working with AMCs report that they continue to feel pressure to make deals work at least some of the time. For their part, representatives from various AMCs defended their business practices and their quality standards. Representatives from several AMCs told WRE that they were at the conference to recruit appraisers face to face because they want the best, even though they have more than enough applicants on file. Sue Potteiger, collateral risk manager at Fannie Mae, announced details of Fannie’s new Collateral Data Delivery (CDD) system, which will mine several pieces of information from appraisal reports, including property address, value conclusion and the appraiser’s license number. The reason: transparency; Fannie’s been burned and doesn’t want it to happen again. The reports will be submitted by the lender, not the appraiser, and will be in the XML format, which is part of Fannie’s new data delivery requirements beginning next year. Several exciting presentations reinforced what the visionaries have been saying for years- that the future of appraising is data gathering and analysis and not form filling. New software from Bradford Technologies, CompCruncher, and others are supporting this push.